Download "1. Who is your current pollution carrier? Expiration Date: Premium: Retroactive Date:"
3 Loc. # of Include all underground tanks located at this facility. Attach additional schedules as needed. Year of original installation: Capacity (gallons): Currently in use? (Y/N) Tanks are Single Wall (SW) or Double Wall (DW)*? Contents: Tank Construction Code: For IL or IC tanks, when was this work completed? (Mo/Yr) Tank Leak Detection Method (Monthly Monitoring): Equipped with spill catchment basin and overfill prevention device? (Y/N) Year piping was installed: Piping is Single Wall (SW) or Double Wall (DW)*? Piping Construction Code: Pressurized (PRS) or Suction (SUC) lines? If pressurized (PRS), are line leak detectors installed? (Y/N) * DW tanks and piping have an annular space between the tank or piping walls. 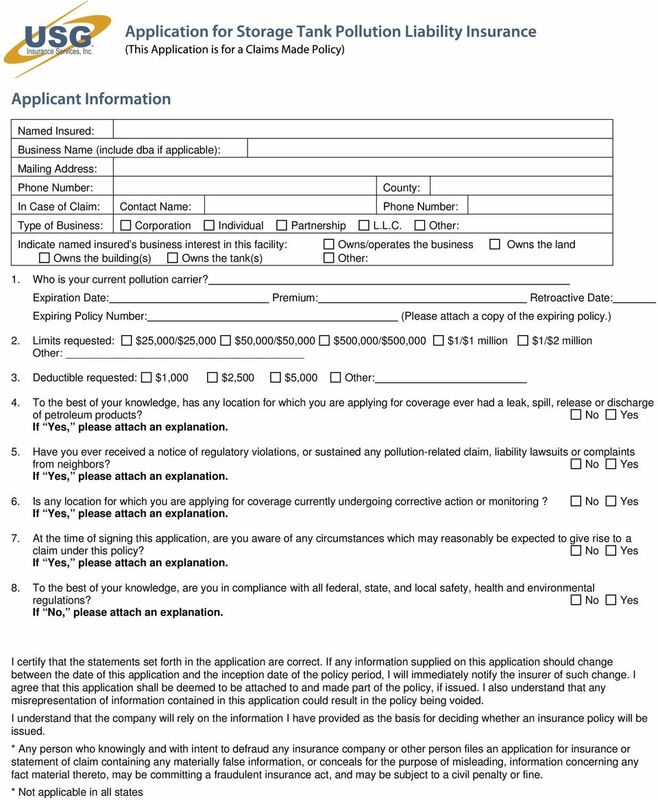 Construction Codes: FRP = CPS = FCS = FLX = IL = IC = Fiberglass (e.g., Owens- Corning) Steel tank with cathodic protection NOT retrofit (e.g., STI-P3) Steel clad with or enclosed (jacketed) in fiberglass (e.g., Act-100) Flexible piping Steel tank retrofitted with interior lining Steel tank retrofitted with cathodic protection (impressed current) Tank Leak Detection Methods (Monthly Monitoring): ATG = Automatic tank gauging/monitoring with monthly leak test IM = Interstitial monitoring (double walled system) - electronic sensor or monthly inspection of annular space VM = Vapor monitoring wells used to look for vapors in soil. Indicate number of wells. GWM = Ground water monitoring wells used to detect liquid product floating in water. Indicate: Number of wells; Frequency of sampling; Any petroleum detected (Y/N) SIR = Statistical inventory reconciliation of data sent to an outside vendor for analysis every 30 days IC/TTT = Inventory control with tank tightness testing every 5 years. Daily stick measurements recorded and reconciled monthly. ONLY VALID FOR 10 YEARS AFTER INSTALLATION OF TANK. 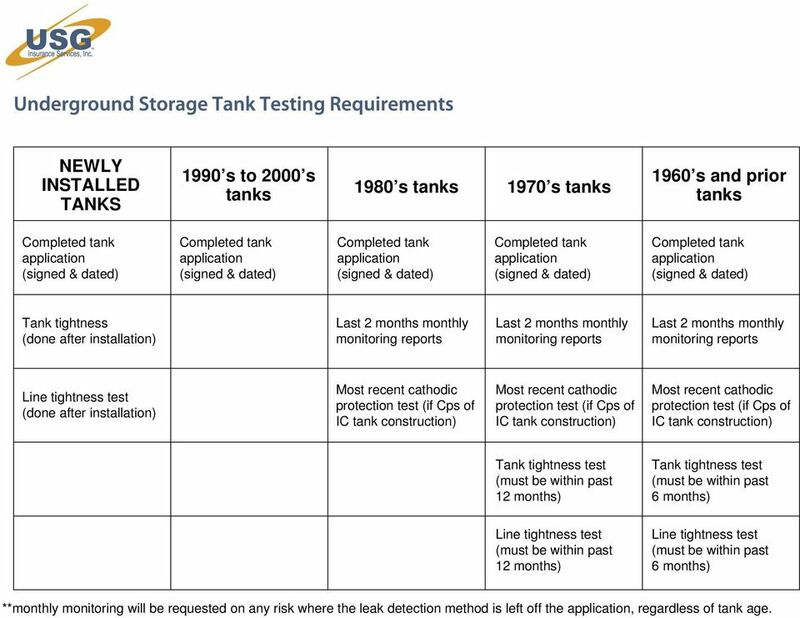 Manual = Manual tank gauging alone may only be used for tanks 1000 gallons or less capacity Manual w/ Tightness Test = Manual tank gauging with tank tightness testing every 5 years may only be used for tanks 2000 gallons or less capacity. ONLY VALID FOR 10 YEARS AFTER INSTALLATION. 4 Include all above ground storage tanks located at this facility. Attach additional schedules as needed. Loc. # of Year of original installation: Capacity (gallons): Currently in use (Y/N)? Single Wall (SW) or Double Wall (DW)? Tank Construction Code: Contents: Is secondary containment used (diking)? 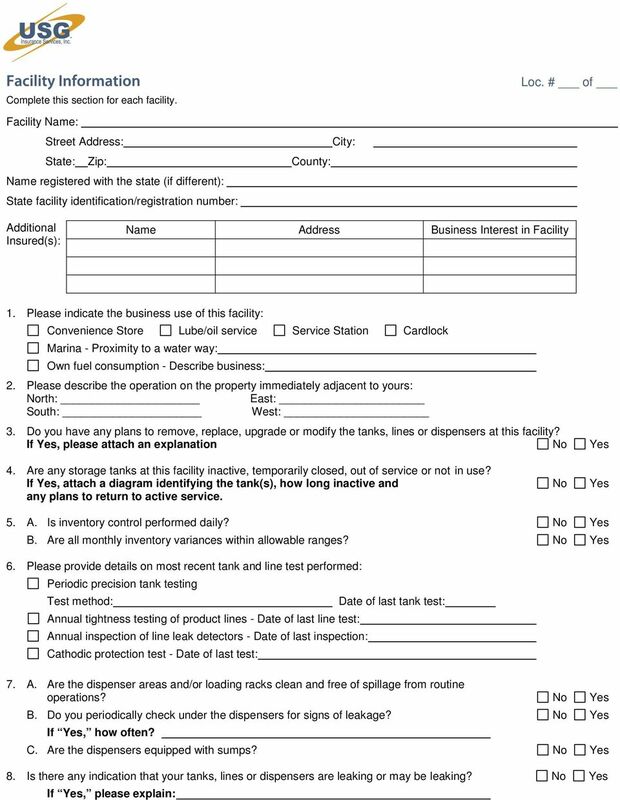 (Y/N) If Yes, indicate type of secondary containment (diking) used: Tank Leak Detection Method (Monthly Monitoring): Date of any tank retrofit, repair, lining or upgrade (describe): Tank pad material (e.g., concrete, stone/gravel, bare earth, etc. 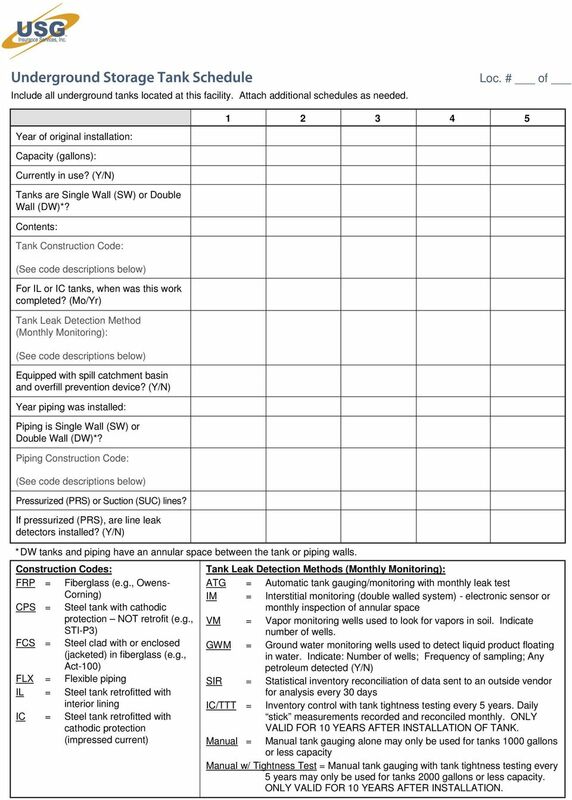 ): Year piping was installed: Piping Construction Code: Is piping underground? (Y/N) If Yes, length underground? 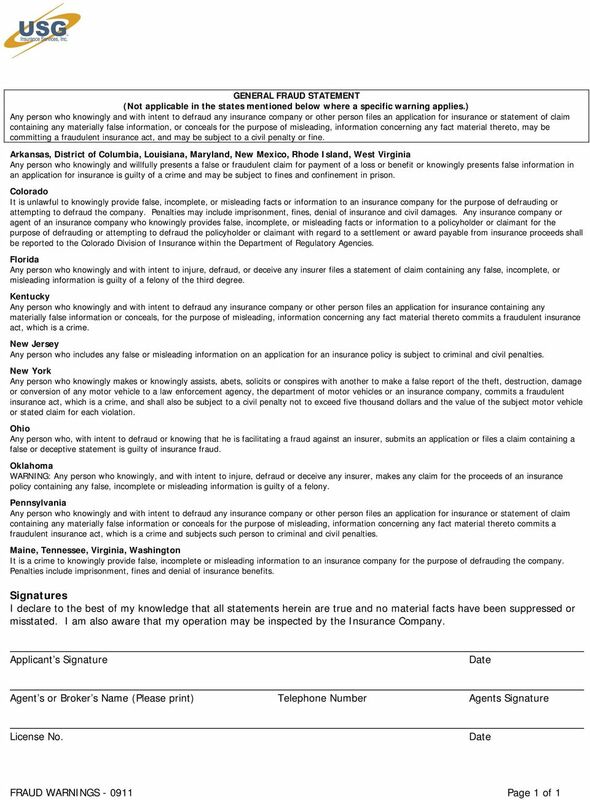 Construction Codes FRP = Fiberglass (e.g., Owens-Corning) CPS = Steel tank with cathodic protection NOT retrofit (e.g., STI-P3) FCS = Steel clad with or enclosed (jacketed) in fiberglass (e.g., Act-100) FLX = Flexible piping IL = Steel tank retrofitted with interior lining IC = Steel tank retrofitted with cathodic protection (impressed current) BS = Bare Steel Secondary Containment (Diking) Codes A = Poured Concrete B = Earthen berm with liner C = Earthen berm without liner D = Other - Describe Tank Leak Detection Methods (Monthly Monitoring) ATG = Automatic tank gauging/monitoring with monthly leak test IM = Interstitial monitoring (double walled system) - electronic sensor or monthly inspection of annular space VM = Vapor monitoring wells used to look for vapors in soil. Indicate number of wells. GWM = Ground water monitoring wells used to detect liquid product floating in water. Indicate: Number of wells; Frequency of sampling; Any petroleum detected (Y/N) SIR = Statistical inventory reconciliation of data sent to an outside vendor for analysis every 30 days IC/TTT = Inventory control with tank tightness testing every 5 years. Daily stick measurements recorded and reconciled monthly. ONLY VALID FOR 10 YEARS AFTER INSTALLATION OF TANK. 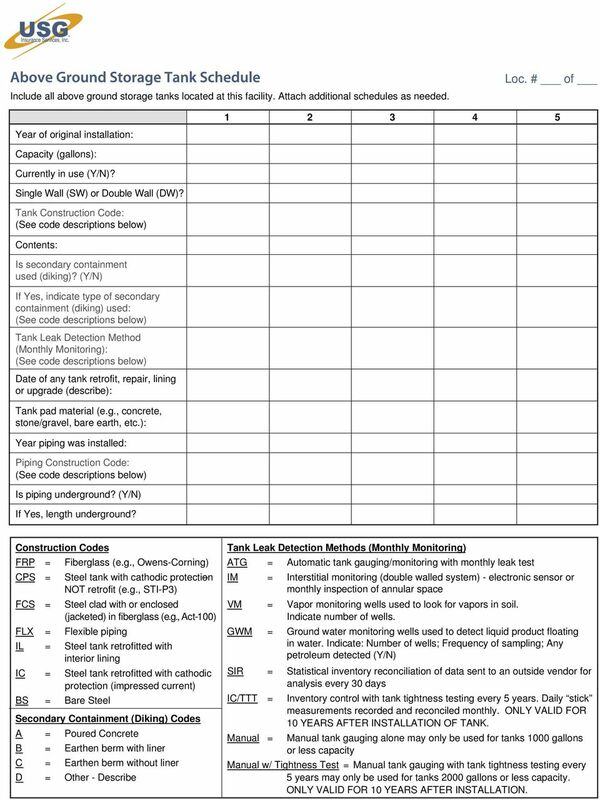 Manual = Manual tank gauging alone may only be used for tanks 1000 gallons or less capacity Manual w/ Tightness Test = Manual tank gauging with tank tightness testing every 5 years may only be used for tanks 2000 gallons or less capacity. ONLY VALID FOR 10 YEARS AFTER INSTALLATION. 5 NEWLY INSTALLED TANKS 1990 s to 2000 s tanks 1980 s tanks 1970 s tanks 1960 s and prior tanks Tank tightness (done after installation) Last 2 months monthly monitoring reports Last 2 months monthly monitoring reports Last 2 months monthly monitoring reports Line tightness test (done after installation) Most recent cathodic protection test (if Cps of IC tank construction) Most recent cathodic protection test (if Cps of IC tank construction) Most recent cathodic protection test (if Cps of IC tank construction) Tank tightness test 12 months) Tank tightness test 6 months) Line tightness test 12 months) Line tightness test 6 months) **monthly monitoring will be requested on any risk where the leak detection method is left off the, regardless of tank age. AUTOMOTIVE RISK MANAGEMENT & INSURANCE SERVICES, INC. 1919 GRAND CANAL BLVD., SUITE C-7 STOCKTON, CALIFORNIA 95207 PHONE (800) 224-6363 FAX (888) 504-8062 Email: apps@armonline.com CALIFORNIA LICENSE NUMBER.